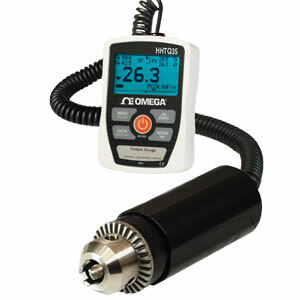 OMEGA’s HHTQ35 Series is an economical digital force gauge designed for clockwise and counterclockwise torque measurements in a variety of applications. They are available in ranges from 10 ozFin to 100 lbFin (7 to 1150 KgFmm) and have a 2000 Hz sample rate. A backlit graphic LCD displays large characters and a menu is available to access the gauges features and configurable parameters. Units have a USB output for data collection and setpoint indicators for pass-fail testing. Nota: Comes complete with carrying case, AC adaptor with US plug, USB cable and CD with USB drivers and operator’s manual. For AC adaptor with European plug add suffix “-E” to model number, UK style plug add “-U”, no extra cost.